ASD Service Learning: ASD Recognized as a Sustainability Champion by Expo2020! 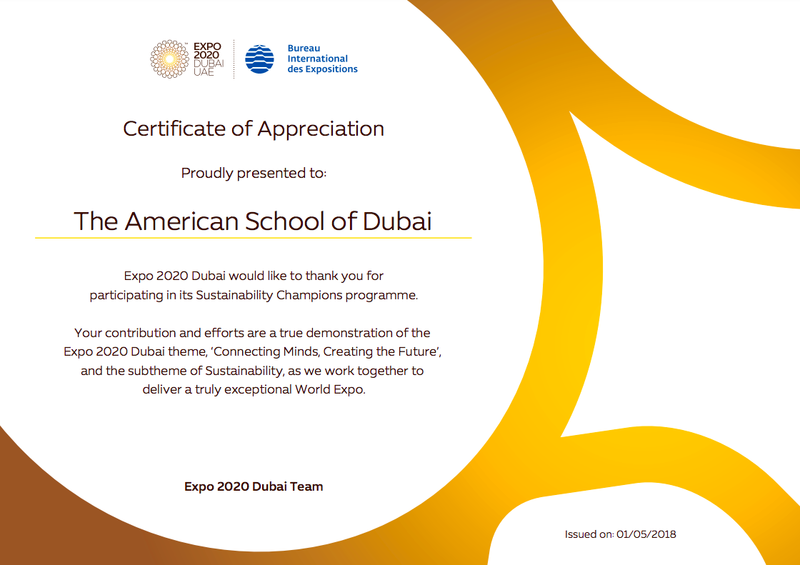 ASD Recognized as a Sustainability Champion by Expo2020! Though relatively early in our sustainability journey, sometimes it really nice to know that what we're doing is being noticed. Case in point, this year we were invited to participate in the Sustainability Champions Competition, a program spearheaded by Expo2020 Youth. Part of the Expo2020 focus in sustainability and this outreach of sorts was geared toward recognizing what is being done in Dubai schools with regard to the different elements of sustainability: Environmental; Social; Economic. 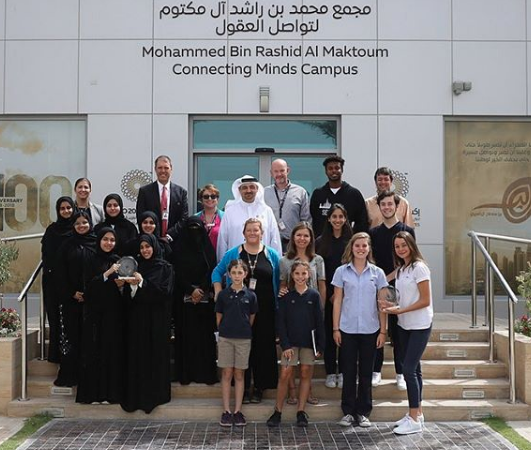 After a rather in-depth process of collating evidence of the learning at ASD, along with pictures and video of our educational work related to sustainability, ASD was chosen as the single international school in the UAE to receive this honor, joining our friends at Umm Al Arab school in Abu Dhabi (the national school category winner). A delegation of ASD students from different divisions and organizations - Sustainability Action Team, Sustain Our World (SOW), Elementary School - were joined by Mr. Jones (Facilities Director), Ms. Julia Martinez (Director of Advancement), Ms. Carden (Garden Coordinator), Mr. Myers (Service Learning Coordinator) and Dr. Richards (Superintendent) in the awards ceremony held at the offices adjoining the Expo 2020 construction area in Jebel Ali. The ceremony included a short introduction of the Expo 2020, a scrumptious meal, the award ceremony itself (of course) and a bus tour of the construction site itself. 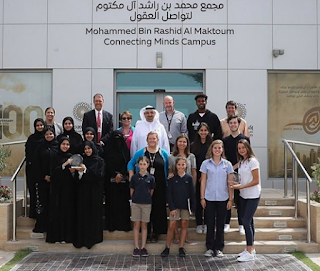 The students and adults in our delegation were delighted with the visit and the connections they made with our new friends! Returning from the excitement of the event we are emboldened by the recognition, which provides us with even more energy to move boldly toward being more sustainable in the future. And when we say "energy" we don't mean just the personal motivation variety. We mean a new photovoltaic (solar) energy system that will be placed on our campus in the coming months as part of the award! We are hopeful that this new solar array will provide energy for a portion (yet to be determined) of our campus' use as well as support learning through not only visits to the solar site but also in the analysis of energy-based data from the site. When facilities and learning come together it really sets the stage for the development of sustainable mindsets! ES Starts Planting Ghaf Trees!